University of Houston Law Center students Fernando Basilio 2L, left, Sydney Nguyen 3L, Carlos Ruiz 2L, and Danny Avila 2L, a research assistant on International Investments and Arbitration. 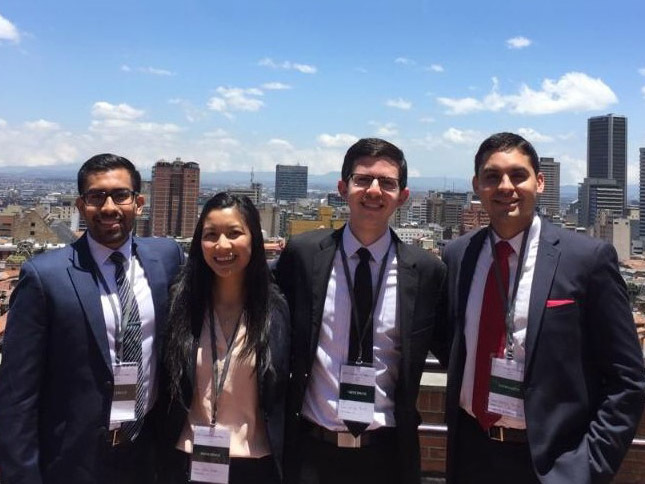 April 26, 2017 — Three University of Houston Law Center students traveled to Bogota, Colombia this semester as they participated in the International Investment Arbitration Competition, a moot court contest done entirely in Spanish. "With the Law Center's proximity to Latin America, providing our students with an opportunity to interact with the Latin American legal culture is a tremendous benefit," said Jim Lawrence, director of the Blakely Advocacy Institute. "Participating in this competition also supports two main goals of the Law Center: diversity and international branding. The fact that the competition is entirely in Spanish makes this competition even more unique." Second-year Law Center student Carlos Ruiz said the competition proved to be stimulating even for someone who grew up speaking Spanish. "It was a very different experience from what we are used to in the U.S.," he said. "Even for a native Spanish speaker, it was challenging to keep a conversation or argument with an attorney that comes from a different educational system. I hope more students are able to have the same experience." For Fernando Basilio 2L, his time in Colombia has inspired him to pursue practice in the field of international investment arbitration. "This experience has opened my eyes to the world of international investment arbitration and it is an area of law that I would like to keep learning about." Sydney Nguyen 3L said the competition was one of the most satisfying and challenging experiences she has undertaken. She credited some of her success to learning Spanish while completing her undergraduate education at the University of Houston. "The problem was complex and covered investment arbitration, a vast area of law that was completely new to me, and a growing field," Nguyen said. "The fact that this competition was completely in Spanish made it especially challenging during the whole process of research, writing, and oral arguments. "When Jim Lawrence asked if I wanted to take on this challenge, I was thrilled and excited to push myself to accomplish something I will never forget. I attribute my experience to my teammates and coaches, Lorena Perez-McGill, Julián Cárdenas García and Eldy Quintanilla Roche, who were all very supportive and crucial to my growth and success from the start."